Valencian paella, history, introduction. | LaPaella.net – Receta de la Paella Valenciana, Paella de marisco y otros arroces típicos. Paella is perhaps the most famous dish of the rich and varied cuisine Spanish. It is a well-known culinary recipe internationally and is found in the usual charts and in the menus of thousands of restaurants around the world. But curiously, ignorance about the true recipe for paella is widespread. Here you will find a reliable recipe for authentic paella valenciana, and other dishes with rice. It was initially assumed that the consumption of rice in Valencia would be limited to use in the form of flour or meal. 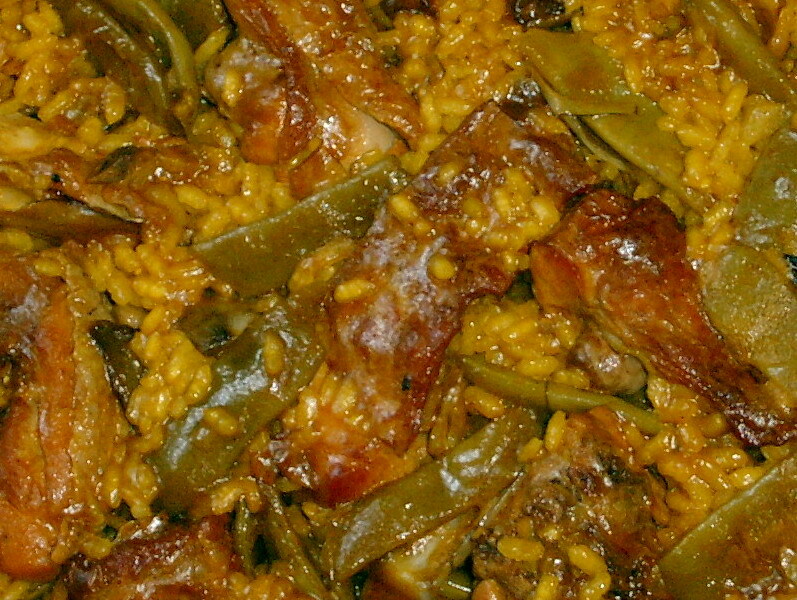 In S. XVI has already been consumed in Valencia rice casserole in the oven and mud from the s. XVIII, and there is documentation on the dish known as paella. The origin of paella, like all popular dishes from each area, is the combination of foods every village had around him. In the area of Valencia and was there (though fewer) a rich area of irrigated orchard that provided to the inhabitants of fresh vegetables. It was also customary to raise chickens and rabbits for family consumption and the proximity of Albufera and its adjoining supplied rice paddies, and also offered the possibility of adding to the paella, occasionally, some element hunting. If we add this fabulous pantry seafood and fish from coastal areas, as well as olive oil itself throughout the Mediterranean basin, we already have all the ingredients with those carried out most of the classic paellas. Just one more thing we lack, the container for cooking. And this container, is none other than paella. In the Valencian language, the pan is called “paella”, hence the name of the most famous dish of Spanish cuisine. In spanish is called “paellera”, although the Royal Spanish Academy of Language supports both meanings. In summary, paella is not just a skillet, usually made in polished steel, which has been stripped of the handle and instead you have two handles attached to support the weight of the dish. Must be of a minimum diameter of about 22 cm. and not very deep, with edges of 5 to 10 cm., depending on their diameter. Theoretically each paella is sized for a quantity of rice, although the dimensions vary greatly depending on the taste or how to develop each cook paellas. I personally prefer that the content of the rice in the paella once stay away in excess of the height at which the rivets are the handles of the container. Made with chicken and rabbit, garrofó (a local variety of bean), tomatoes, green beans (in Valencia we put “tabella”, “rotjet” and “ferraura” which are local varieties of green beans), paprika, oil olive and saffron or, failing that, food coloring and of course, rice. In season also supports artichoke and peas. Which besides the ubiquitous rice is made with seafood such as cuttlefish, squid, mussels or clótxina (Mediterranean mussel variety, but smaller, thin and tasty), shrimp, crayfish, mantis shrimp, lobster, clams, garlic, olive oil , tomato, paprika, saffron or coloring and a broth made with fish smaller than in Valencia called trash. But the paella in Valencia is much more than a couple of dishes with rice, there are hundreds of recipes that are a true reflection of the culinary traditions of the area where they are produced. In this website you can find a selection of recipes. I hope you enjoy and that you come to appreciate and enjoy the Valencian rice as much as we do.